In a world of mind-controlled robotic limbs, artificial intelligence, and technology reaching all new heights, it’s hardly a surprise that drone delivery services are beginning to become a reality. Something that only a few years ago may have seemed like a futuristic gimmick is fast becoming a reality and it’s not going to be long until we see an armada of drones circling the air with packages ordered only hours ago… or are we? While it’s true that companies such as Amazon and Google are heavily investing both time and money into drone research, there are many intrinsic logistical issues that surround the use of drones. 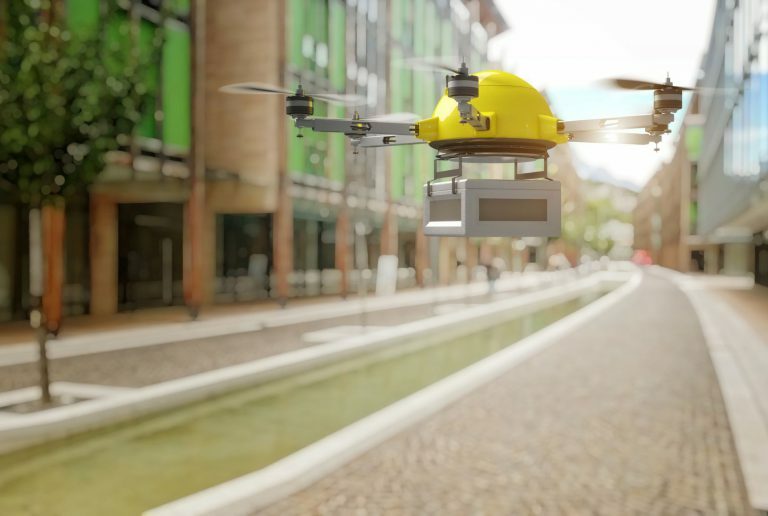 This post looks at some of the advantages and disadvantages of using drones in the same-day delivery sector and what the future of delivery may hold for us all. Customers are craving fast delivery and are beginning to expect same-day delivery as a given. This puts a huge logistical strain on companies to be able to deliver it at all, let alone as quickly as the customer would like. Factors such as fulfilment centre placement and traffic nightmares can affect a company’s ability to quickly deliver packages to customers. This is where semi-autonomous drones should come into their own. Not bound by traffic jams and slugging it around the M5, they could offer much faster delivery and would be able to travel from depot to customer as the crow flies. Amazon claims that it’s working toward a point where the customer can receive a drone delivery they’ve ordered in just thirty minutes. Talk about setting the bar high when it comes to express delivery. In addition to faster deliveries, using drones could be more environmentally friendly because drones run on a battery instead of spilling fumes into the surrounding area. As companies strive to improve environmentally friendly production, the drone seems to be the way forward for small deliveries. Drone delivery could theoretically cost companies less in the long run. While investing in the technology and developing it is initially going to cost more than leasing vehicles, it is at cost parity with current courier systems and may well begin to become cheaper for short distance deliveries. With many companies citing the ‘last mile’ as the biggest expense (searching for an address or recipients not being home increases both the time and cost), drones that can access back gardens or safe delivery spots could solve that issue, thus eventually reducing door to door delivery costs. Despite the many benefits of drone delivery, there are challenges faced by those wishing to utilise the sky. Firstly, although they’re environmentally friendly, they are restricted by weather conditions than what a traditional courier would be. It’s highly unlikely that a lorry delivering parcels will be blown off course, but that’s a definite possibility with a small lightweight drone. What will happen during storms when it becomes unsafe for drones to be out in force? Will deliveries be put on hold until weather conditions improve? Then we must consider the logistics of delivering a parcel at the drop off point. What if your pet is injured by the drone releasing its payload? Or your fluffy little family member destroys your parcel left in your garden while you’re out? Maybe even more terrifying, what if something were to go wrong and the drone drops a payload mid-flight? If someone was hurt, who would be to blame? Another major challenge for drone delivery is the red tape surrounding it. While the UK is currently being forward-thinking enough to offer its airspace to drone delivery development, over in the US, companies still need to get a regulatory license to utilise the air. Restricted areas near airports and other protected zones close to military bases need careful consideration. This means that even if the technology gets off the ground (pun intended), there’s still a plethora of legal matters to overcome. Will the rise in drone delivery lead to mercenaries and piracy of the skies such as packages getting hijacked mid-flight? While this may seem a little far-fetched, companies planning to use drones are going to have to prove their drones are highly unlikely to be hacked and the contents stolen in that manner. Public image is another problem that drone technology will need to overcome to be accepted. Technological advances are not always welcomed by the masses and concerns for the safety of information (is that drone spying on me?) and their deliveries will be burgeoning. Having said that, already around 40% of consumers said they would consider drone delivery if it meant getting their parcels faster. But none of this really matters if companies can’t guarantee the safety of their drones and their payloads. Plus, we’ve all seen videos of home-owners shooting down drones that dare to enter the space above their homes. With major industries getting on board with developing drone technology, it’s safe to say that at some point they will come into regular service. But whether they take over the market place is still to be seen. It would seem to be a good thing for small, low-cost deliveries. As long as the companies prove their reliability and safety, then consumers will get their goods delivered quicker and the environment would benefit. For all its benefits, however, the size and bulk of parcels mean that this technology will not be suitable to deliver an aeroplane wing or a costly car part. It seems drones will still need to be integrated with regular delivery modes but they simply could not completely replace our delivery infrastructure. Perhaps a more likely future will involve a professional courier service driving to a neighbourhood and releasing a small army of drones to streamline the last-mile delivery process, where the most money can be saved. All in all, it’s safe to say there will always be a need for professional couriers, no matter how high-tech the future becomes. What do you think the future of drone delivery will look like? Do you welcome the prospect of faster delivery, or does a sky buzzing with drones fail to appeal? Let us know your thoughts! This entry was posted on Tuesday, April 10th, 2018 at 8:01 pm	and is filed under Courier Services, International Couriers, Sameday Couriers. You can follow any responses to this entry through the RSS 2.0 feed. You can leave a response, or trackback from your own site.